Ibrox Noise: What on earth has happened to Jordan Rossiter this time? What on earth has happened to Jordan Rossiter this time? Despite things going well down Ibrox way of late, one quizzical puzzle has definitely surfaced in recent matches, and it’s eye-opening. Jordan Rossiter has completely disappeared after briefly appearing to reaffirm himself back in the match day squad and even first team. 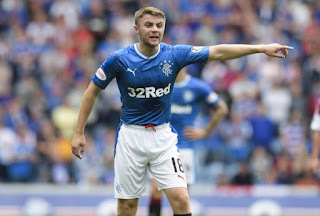 Last seen on the bench against Motherwell (he got no game time), Rossiter has been AWOL the last two SPL encounters and tellingly wasn’t involved with the reserves on Monday. We wonder what has happened this time to make Rossiter unavailable, albeit he remains in training and was present yesterday at Auchenhowie for the pre-Aberdeen session. We wonder if his place on the bench is being rotated with Ross McCrorie, who has made a reappearance in the squad of late, and there would be little point having two defensive midfielders on the bench. It is a hell of a problem for Steven Gerrard to have – there are literally five DMs available for selection (Coulibaly, McCrorie, Rossiter, Jack and Halliday) plus Greg Docherty’s possible return next month – it’s certainly not a position which requires further bodies anyway. But we really do hope Rossiter is fit and available – and he did seem pretty able and in good spirits yesterday. Neither Docherty or Halliday are defensive midfielders. They might have been shoe horned into those slots but they could never be considered defensive midfielders to trade. Halliday is a utility man who, previous to joining Rangers was a traditional left-footed box to box midfielder, Docherty would be considered in the role Arfield currently occupies. This notion that we have an abundance of defensive midfielders is quite honestly false and I am sick to death of Rangers playing players out of position. Jon Flanagan is another who frustrates, he Is never a left back and should only ever be deployed on the right. Jacko. Correct! You did though miss Katic. His previous manager claimed he only played him in defence as he had no one as good but every chance he got he played him in Midfield and was magnificent (his words) at 6'4" he would give steel in there. We still have Jack, Rossiter, McCrorie and Coulibaly which is too many for one position. I would send Coulibaly home and try to develop Rossiter and McCrorie behind No 1 choice Jack. A 6 month loan could really help Jordan , Maybe down south in league one/two. Not a lot of clubs will actually fancy him because of his fitness issues so we may need to foot the bill but if he could play 10-15 games he might get in contention next pre season. Can Run Rangers CM for Nxt 10yrs! He's maybe getting papped out in January. I did warn you months ago that people were expecting too much from Rossiter. It seemed to me he was getting better with every week he didn't play. If he's fit and taking part in training then presumably the manager "has better options". He is a young player with potential. Nothing more or less. I hope he can go on to prove me wrong.